Thing 2: Specific, Measurable, Achievable, Resonant and Time-specific? 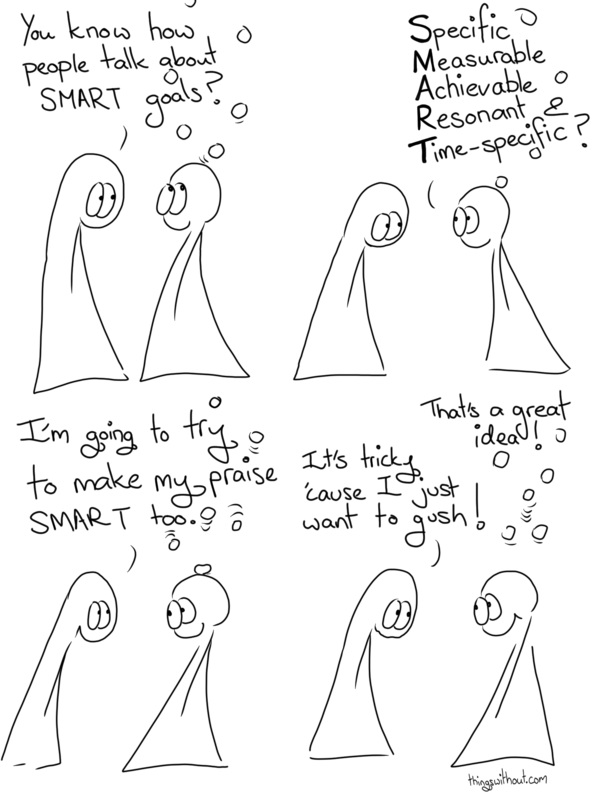 Thing 1: I'm going to try to make my praise SMART too. Thing 2: That's a great idea! Thing 1: It's tricky 'cause I just want to gush! On the weekend Liz went to the Northwest Derby Summit organized by Getsome Athletics. It was good. During the summit she went to a class on Team Dynamics with LeBrawn Maimes/Torrie Higgins a Rat City Rollergirl All Star and Sports Psychologist. Praise and feedback loops can be tricky things. Liz has been thinking a lot about praise and how frustrating it can be when you’re asking for empowerment and get a lot of comfort instead (which can then create complicated relationships with comfort) and how she can ask for what she needs better. One thing that really struck her was how fabulously specific LeBrawn was with all her examples of feedback/praise/crits, nothing was vague, it was “this specific thing just then/recently rocked!” sort of stuff. The derby summit was full of learning opportunities and we wouldn’t be surprised if a few more reflections from that experience worked their way into the Things! edited to add: There are quite a few different iterations of SMART objectives and a lot to be said for the more traditional “Realistic” use of the letter R. Realistic is great when it comes to praise… resonant was just so… resonant and to us evokes something that is truthful AND communicated in a way that the person is more able to hear.